I recently discovered a great desktop and mobile App called cram to make and share flashcards for studying and learning and also general interest topics. I have it synced across all my devices (online, iPhone and iPad) and I can create my own flashcards and use them in a variety of ways to help me learn. I created a few flash cards to learn French numbers and then I can review them or enter cram mode. 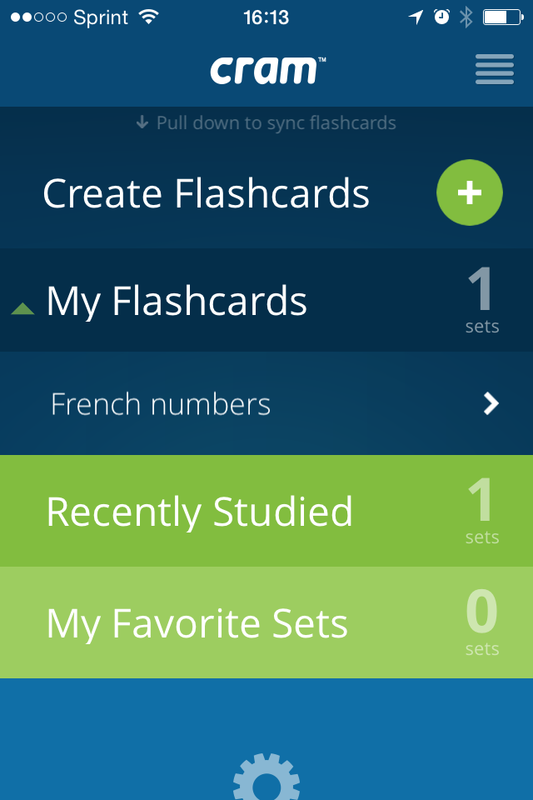 After just a few minutes in the app I created my French Numbers flashcards which you can see in my main menu pictured on the right as viewed on my phone. I go into my French numbers and then I have my card set menu, with options to help me memorize my card set. If I enter cram mode it remembers how I am doing as explained below. I can keep my card set private or share so tutors could create card sets for particular topics to help their students learn the material or cram for a quiz. I can enter a one word answer for the reverse of the card or an explanation and can even record answers for pronunciation. You can also search for card sets that have been made public by other users. Naturally, you don’t know if they are right and sometimes making the cards is half the learning experience but there are some great sets out there for the ASVAB and other tests our students might be preparing for. Flashcards are the fastest and best way to memorize almost any type of information. Whether you’re memorizing multiplication tables, vocabulary lists, a new language, or just plain old definitions, flashcards will help you organize the information in a way that helps you learn more efficiently. Cram is especially useful because we utilize the Leitner System of studying. This system has helped thousands of students around the world memorize large amounts of information. Flashcards have been in use since the 19th century, but web and mobile applications have made them even better. 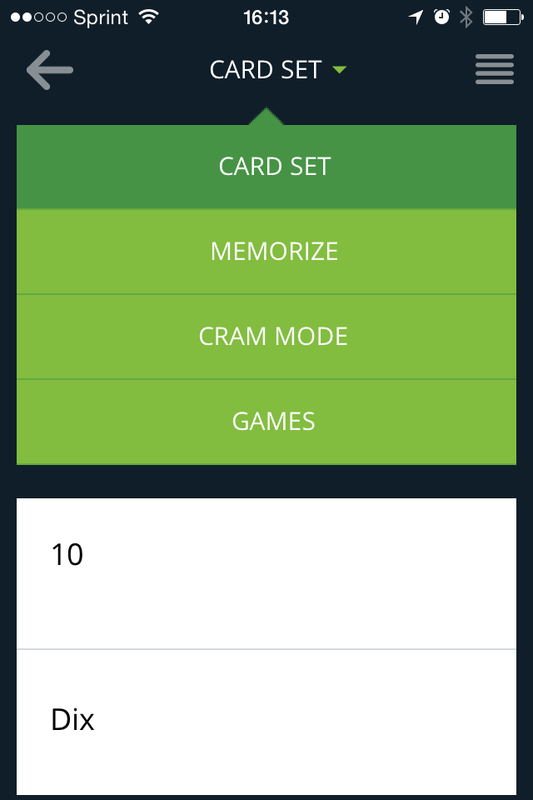 Using Cram.com, we can automatically hide cards you already know so that you can focus on the ones you don’t. Any flashcard set can also become a memorization game, so that you can compete, have fun AND learn your flashcard set. If you want to practice your set in a test environment, we can make your flashcards into multiple-choice, fill in the blank and matching questions – automatically. You can now test yourself before ever entering the classroom. Still not convinced? Choose any of our mobile apps and take your flashcards with you on the bus, train, plane or however else you get around town. Start browsing now and find the perfect set to study. 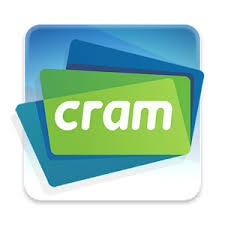 Cram is like having your own personal flashcard library in your pocket. Start studying and learn something new today! In the early 70’s a German psychologist named Sebastian Leitner devised a learning system that made selective learning possible with less effort than the traditional method of studying a set of flashcards sequentially. Leitner’s system consists of a cardboard box separated into a number of compartments. The compartments are filled with flashcards that are moved from one compartment to another, according to the current level of knowledge. When a flashcard is answered correctly, it is promoted to the next compartment. When a flashcard is answered incorrectly, it is demoted to the first compartment. When studying the flashcards in a given level, you go through the set normally and choose if it’s right or wrong. When all of the flashcards from the compartment have been answered you are presented with a summary of the results. When the results are saved, all flashcards that were answered correctly are promoted to the next level. 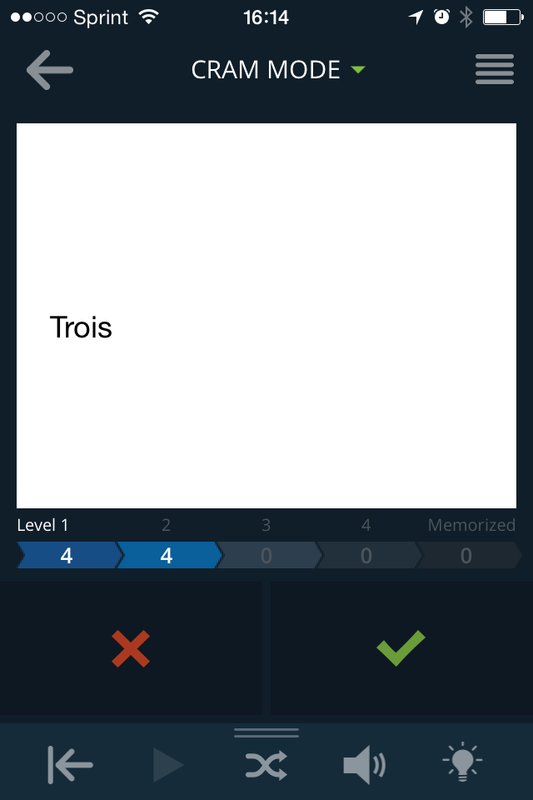 Flashcards that were incorrect are demoted to the first level. A set is complete when all flashcards are in the highest level. The result of the Leitner System is that you are automatically pushed towards focusing on the more difficult flashcards that are giving you the most problems. 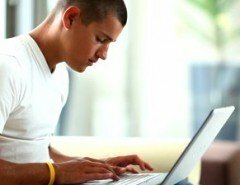 Selective Learning: Prioritize your studying by focusing on the proper level—each level represents a degree of knowledge. This allows you to learn what you need to learn, when you want to learn it. Staggered Learning: With Cram staggered learning minimizes the amount of time required to complete a set and maximizes information retention. Automation: Flashcards are moved between the levels automatically, making it easy to see which flashcards you need to study and improve on. Assessment: By examining the distribution of flashcards within the various compartments you can easily gauge your mastery of the subject. Community: Cardsets can be made up of any of the hundreds of thousands of flashcards in our system. Add these flashcards to your own set to leverage the time spent by your peers creating these flashcards. With Oases Online Tutoring Data Management you can keep track of your students’ tests, learning plans, sessions and any card sets you assign them in Cram! 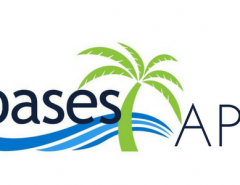 Keeping your tutoring data in one place lets Oases manage the record keeping and you are free to tutor.